The Washington State Cougars were unanimous in acknowledging they played horribly in Friday’s Apple Cup. However, the Cougars almost matched their sky-high turnovers total when offering varied theories behind their wretched performance. Following are five explanations – one per lost fumble – the 20th-ranked Cougars came up with following the unranked Huskies’ 45-10 romp at Husky Stadium. Let’s toss in two bonus explanations for a total of seven, which matched WSU’s turnovers. So much for losing with class. Leach also showed questionable judgment in explaining – sort of – the absence of quarterback Luke Falk. Thus, Leach made it sound as if Falk had a choice in the matter. Multiple sources connected with the Cougars say Falk suffered a concussion – his second head injury in as many games – last Saturday against Colorado. Leach, of course, almost never says a word about player injuries. Nothing changed Saturday in that regard, and Leach wouldn’t even say when he decided to give Bender his first college start. “That’s definitely none of anybody’s business in here,” he told a roomful of media. Bender, a redshirt freshman, said Leach told him last Sunday he would start against the Huskies. So much for Leach’s latest game of secrets with the media and, therefore, with the fans who make his $2.75 million annual salary possible. Leach always says he does not want to use injuries as an excuse, but he did say the Cougars “had some understandable distractions” this week. Presumably, he was referring to considerable public and media focus on the playing status of Falk, all of which Leach could have prevented by going public with the news he gave Bender last Sunday. Oh well. As superbly as Falk has played this season, it’s doubtful he could have made a 35-point difference, though Bender did throw a pair of second-half interceptions that were returned for touchdowns. The Huskies’ impressive young defense also returned a fumble for an interception in the final half. And the offense as a whole? One of WSU’s toughest players, star wide receiver Gabe Marks, left the game in the final minutes with an apparent leg injury after being tackled and landing awkwardly. Marks’ status for Washington State’s bowl game is uncertain. Ditto for the three other offensive starters who sat out Saturday, presumably with injuries: Falk, offensive tackle Joe Dahl and slot receiver River Cracraft. 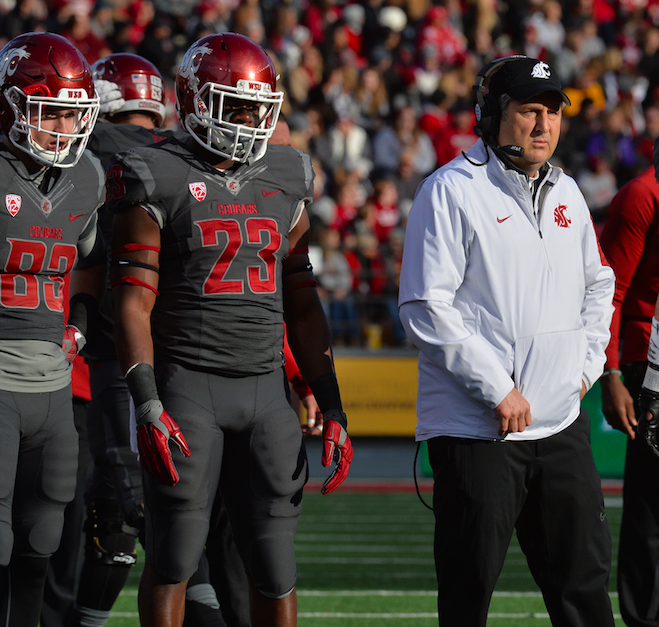 WSU’s depth has improved substantially during Leach’s four years on the job, but no team can lose four players of that caliber without a negative impact. The worst of teams can continue to fight, however, and the Cougars went down meekly against their arch-rivals. The seven turnovers were a season high; the 10 points, 288 passing yards and 319 total yards were season lows; the five lost fumbles were one short of the school record. The Huskies, meanwhile, tied school records by recovering five fumbles and returning two interceptions for touchdowns. Washington also recorded a third consecutive win over WSU. The Cougars have never – not once – won more than two in a row against the Huskies. That’s not easily done when you’ve played an opponent 108 times since 1900. Allison and Bender referred to the Huskies as “a great team.” That seems a bit overboard for a 6-6 squad that finished 4-5 in the Pac-12 Conference. Washington looked great on Saturday, but as Bender noted, “When you turn the ball over seven times, it’s hard to win.